Pundi X 101: What Do You Need To Know About NPXS? Built around the ambition to make the cryptocurrency use as “easy as buying bottled water” Pundi X project was launched with a clear mission statement: making it possible for users and businesses to acquire and use cryptocurrencies at any time and in any place. The currency’s business model allows the merchants to sell their stuff by recording transactions directly on the blockchain, eliminating the need for the mainstream credit card services. It made possible using Pundi X hardware devices which are installed on the merchants’ point-of-sale payment processing systems. In addition to cutting the path between retailers and customers, Pundi X developers see the project bringing easier access to essential banking services for the larger populace in the developing countries. What Problems Does Pundi X Solve? The project aims to make cryptos more accessible without the need for the users to understand how they work under the hood, just as they can use smartphones without studying their technical manuals. This is different from most of the cryptocurrencies, including Bitcoin, which are complex pieces of technology with a rather steep learning curve. Concepts like “blockchain,” “private keys” and “wallets” remain obscure for the population with no interest to delve into the technical details. Inability to use cryptos as a means of payment for buying everyday products hurts both the crypto-friendly merchants and users. Pundi X hopes to correct it with its software and hardware solutions. The team sees a flaw with the existing cryptocurrency ecosystem in the fact that the range of products and services one can buy with cryptocurrencies is still limited. In many cases, the products are offered by specialized stores most people have never heard before. Pundi X offers its solution for easier purchase and conversion of cryptocurrencies for both new and experienced users. Even those who are more or less familiar with cryptocurrencies often have a hard time making sense of all the operational intricacies of cryptocurrency exchanges, like managing passphrases and authentications and keeping up to date with the market trends. These components are supposed to help Pundi X bring to life what its creators describe as the preservation of “the original Bitcoin vision” concerning its implementation in real life and providing an incentive to use cryptos as a means of payment. While the vision promoted by the Pundi X team reflects the cryptocurrency’s global ambition, there is a strong localized focus in its plans for the implementation of the Pundi X platform. The project gives preference to underdeveloped regions of the world which face lower rates of adoption and the insufficient access to the banking services. Plans to establish Pundi X as the payment solution start with the distribution of special Pundi XPOS devices whose sole purpose is to minimize the obstacles to buying stuff with cryptocurrencies for both the merchants and customers. The device makes it possible to buy goods and services at brick and mortar shops for the customers just as they would do with a credit card. In turn, retailers can access their accounts through the Pundi X platform and choose the settlement currency of their preference. Pundi XPOS device supports payments with crypto wallets (Qbao, X Wallet, Nem Wallet, and others) and standard mobile wallets. Payment apps including Alipay, E2Pay and WeChat Pay are also supported, making it easier for retailers to accept and work with cryptos, and manage all these payment channels with a single device. In addition to goods and services, customers can also use their Pundi X mobile app to purchase and sell supported cryptocurrencies (BTC, ETH, ERC20 tokens and others) whenever the XPOS device is installed. For example, if a customer wants to buy Bitcoin, he or she will see its prices in local currency. What is left is to scan a QR code, and the transaction goes through. Merchants can integrate Pundi XPOS devices with their existing POS systems such as card readers and NFC payment platforms. The XPOS devices are connected to Ethereum blockchain via communication layers running Xplugins. These layers, in essence, “imitate” payment system used by standard banking transactions. The process supports payment verifications and approvals by having one of its layers forward the purchase request while the other one makes a record of a successful sale. All transactions made with a cryptocurrency are processed through the check-out menu, which supports printing receipts for the merchant and customer. Finally, management of orders and inventory is also supported by XPOS devices, alongside retail intelligence and loyalty programs. The main selling point for these devices is the promise of lower transaction fees compared to what is offered by the major card businesses like Visa or Mastercard. In addition to fees, Pundi X must match what these competitors offer in the transaction speed segment, meaning that payments with XPOS devices have to be instantaneous. This is why Pundi X team opted for integrating their solution with two blockchains, namely Ethereum and NEM. NEM is known to support fast payments and is popular in the Asian financial markets Pundi X is focused on in the initial stages of its deployment. At the moment, the team is also working on its Function X blockchain in which each XPOS device will serve as a single node. Also, XPOS devices are smaller and easier to install in cramped retail spaces compared to Bitcoin ATMs. Global retailers are rewarded for installing Pundi XPOS device to manage their transactions, while the customers receive discounts and free NPXS tokens which are redeemable in the next purchases. The manufacturing of Pundi XPOS devices began in February 2018. Pundi developers promised the delivery of more than 100,000 POS devices which will be distributed in 12 countries in the next three years. The first countries in this scheme are China (Hong Kong), Indonesia, Brazil, and Columbia. Implementation of the Pundi XPOS devices needs to be coordinated with the adoption of Pundi payment apps which are also managed as parts of the platform’s ecosystem. A dedicated fiat payment app named “M-Bayar” (also known as Pundi-Pundi before its rebranding in mid-2018) is now made a part of the E2Pay payment gateway system which operates in Indonesia. Under this partnership agreement, Pundi X will be given the right to use the E2Pay’s license to legally perform the crypto-to-fiat conversions in this country. Installed Pundi XPOS devices already offer access to existing cryptocurrency exchanges. Users choose their desired cryptocurrency and exchange based on the offered level of price and service and their individual needs. Pundi platform is expected to help the users make informed decisions on choosing the right crypto exchange by presenting them with many combinations of prices and services on offer. Besides, the system is designed to help the users better manage their donations with cryptocurrencies. Instead of forcing less experienced users to go through the complex payment procedures which involve exchanging popular cryptos for fiat currencies during emergencies, Pundi X supports donations via multiple cryptocurrencies. When earthquakes recently hit Indonesia, Pundi X offered its infrastructure to enable the sending of donations in Pundi X tokens, ETH, BCH, and BTC, raising more than $42,000 in the process. Recently, Pundi X partnered with the Stellar protocol to become a payment anchor for the Indonesian Rupiah and offer cheaper cross-border payments. Similar partnership projects have been launched together with Wanchain, Zcash, Verge, and others. What Are XPASS Card and XWallet? To further streamline payments on the Pundi X platform, the developers are also working on introducing their XPASS payment cards to the general audience. The card stores multiple cryptocurrencies running on the NEM blockchain and is designed to resemble standard debit and credit card. It stores encrypted private key information and protects the users’ crypto assets. The card will work in conjunction with the distributed XPOS devices, allowing users to buy goods with a simple swipe or tap against the device at a physical store. The card connects with the appropriate mobile app and crypto wallet and offers secure payment of the best value for the supported cryptocurrencies. The XWallet developed by the Pundi X team serves as a complement of the XPASS card. Its main task is to act as the bridge between the main components in its payment ecosystem, i.e., the devices and wallets in use. In addition to making mobile payments with the Pundi XPOS device possible, the wallet app allows the users to manage their cards remotely. This entails the management of the user’s digital assets and easy checks of current balances. Transactions made with this wallet or XPASS card are immediately processed online and on-chain, with an added option of scanning the QR code and uploading it to blockchain later in case there is no available data connection. Each wallet has a native system of username and password protection, with the ability to instantly retrieve data from any phone, XPASS card or payment device which becomes linked with the app. In October 2018, the Pundi X team announced making what they described as the first blockchain-based phone call in history. The prototype phone does not need a centralized mobile carrier and its runs on the experimental Function X blockchain which is still under development. The phone will use a custom-made communication protocol for mobile devices which will run on the blockchain. The launch of the XPhone is scheduled for Q1 2019. What Is the NPXS Token? NPXS is an ERC-20 token which fuels transactions on the Pundi X platform. It also provides rewards to the token holders and retailers using its transaction network. Pundi X developers also work on the application store which would allow the owners of the NPXS tokens to develop and publish apps on it. Applications can deal with streamlining the existing transaction management system, management of loyalty programs and wallets and more. 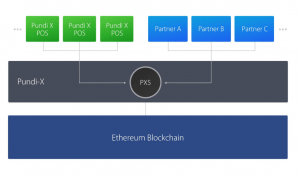 Pundi X ecosystem is also home to the NPXSXEM, a Pundi X utility token built on the NEM blockchain. These tokens are used to support the operation of customized NEM XPOS devices. Pundi X ICO took place between September 2017 and January 2018, raising $35 million in the process. The team retained $15,750,000, with the same amount going to early investors and the rest kept by the Pundi X team for marketing and development. Pundi X has a market cap of $215,913,108 as of November 13, 2018, down from its historic high of $378 billion in mid-2018. Its circulating supply is 142,603,994,148 NPXS, out of a total supply of 280,255,193,861 tokens. NPXS are traded on various crypto exchanges such as Binance, Bittrex, Hotbit, Gate.io, and others. Who Is The Team behind Pundi X? The Pundi X project has its roots in the launch of Pundi-Pundi payment application in 2017. The company behind the project has about 150 full-time employees. The Pundi X team consists of crypto-enthusiasts from China and Indonesia. Zac Cheah is the CEO and co-founder of the Pundi X company. He has more than a decade of work experience in the browser and mobile game development. Other important team members include CTO and co-founder Pitt Huang, company's president Constantin Papadimitriou and others. Crypto.com (MCO) - payments and cryptocurrency platform seeking to accelerate the world's transition to cryptocurrency. TenX (PAY) - seeks to make any blockchain asset spendable instantly. Bankera (BNK) - a borderless bank for the blockchain era.